20.5" x 20.5" x 10.75"
13.5" x 11" x 13.75"
65.4" x 43.7" x 8.9"
34.8" x 34" x 9"
48.8" x 53.1" x 16.4"
21" x 34" x 8"
66" x 42" x 8.5"
21" x 37.4" x 5.1"
19" x 22.5" x 9.75"
Begun in Japan, 1999. Completed in United States, 2005. Japanese ash, linen, clear urushi, black urushi, green lacquer, gold leaf. 77.75" x 24" x 24"
For over thirty years, Yoko Zeltserman-Miyaji has masterfully worked with urushi (Japanese lacquer) and wood. Her furniture is fabricated and formed without screws and nails, using the ancient tradition of mortis and tenon joinery. Miyaji is a pioneer as well as a master furniture maker, the first female Japanese artist combining historical techniques and materials to create contemporary furniture reflecting the American Studio Furniture movement. Miyaji incorporates ancient and contemporary designs using various methods of kawari-nuri (pattern-making) techniques. 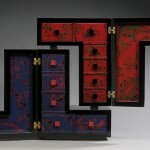 Layers of polished urushi and paint are combined to bring out intricate patterns and saturated colors. Several layers of urushi are applied to each piece, with each layer taking weeks or months to dry properly. Miyaji’s rich cultural heritage is reflected in her traditional practices and techniques. Inlaid eggshell is used for decoration, linen on wood for strength, and Japanese brushes made from women’s hair for painting. Her urushi is hand-mixed, starting with a clear urushi powder (akaro urushi) and various pigments are mixed for two to three hours. The importance of keeping the tradition of urushi furniture alive inspires Miyaji to use everyday materials such as beans, macaroni, rice, or soles of slippers to create richly embellished and exquisitely lacquered surfaces. It all started for me when I was a student at the Kyoto City University of Art in the early 1970s. I saw a slideshow of something new and current being made by artists in America: contemporary studio furniture. American artists were moving beyond craft and making pieces that were truly sculptural. It was the convergence of sculpture and furniture, by women such as Judy Kensley McKie and Wendy Maruyama, that captivated me. I switched my major from urushi (Japanese lacquer) to wood, and decided to devote my artistic career to making functional and sculptural studio furniture. Urushi is a material iwth a long history in Japan and one that I feel a deep connection to. I strove to develop my own artistic sense and style using traditional materials and techniques in a contemporary way. My furniture was something new and different in Japan and I’m not sure if it was really understood. I was something of a novelty, a woman furniture-maker working in what was considered a man’s field. Ten years ago, I moved to America and began to make and show my work here. I shared a group studio surrounded by other artist’s work and became aware of the differences in my work. I realized my woodworking techniques, urushi finishing, and artistic sense has a rich tradition, and the roots of Japanese culture became my inspiration. The influence of Japan is reflected in my Butsudan series. These are not traditional butsudan (family altars), but a contemporary version. One common thread in my work has been to make pieces to hold or display objects that are precious or important in some way. After completing the Butsudan series, I worked on the Chigai-dana series. A chicai-dana (stepped shelf) is traditionally used to display and showcase objects in a Japanese home. My contemporary version illustrates my vision of creating a balanced structure with open spaces.